The St. Joan of Arc Church Carnival is scheduled for Monday, Aug. 22 to Saturday, Aug. 27 on the church grounds at Evans and Willow Bend roads. 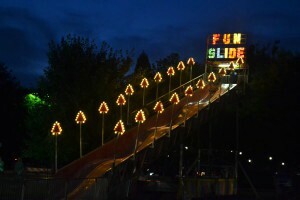 Rides, food and games begin at 6 p.m. Nightly entertainment will also be on hand. There will be a super 50/50 (last year’s winner took home more than $26,000) and hourly raffles. Also being raffled off is an iPad Pro. All-access ride bracelets will be available for every night of the carnival and can be purchased in advance in the church vestibule after weekend mass or at the rectory through Thursday from 9:30 a.m. to 12:30 p.m. and 2 p.m. to 5 p.m., for the special price of $25. Cost at the carnival will be $35 per bracelet. All proceeds benefit St. Joan of Arc School. For more information, call (856) 983–0077.